Boss No More and a New Mason Jar features before and after pictures of my newly painted faux-stone fireplace. 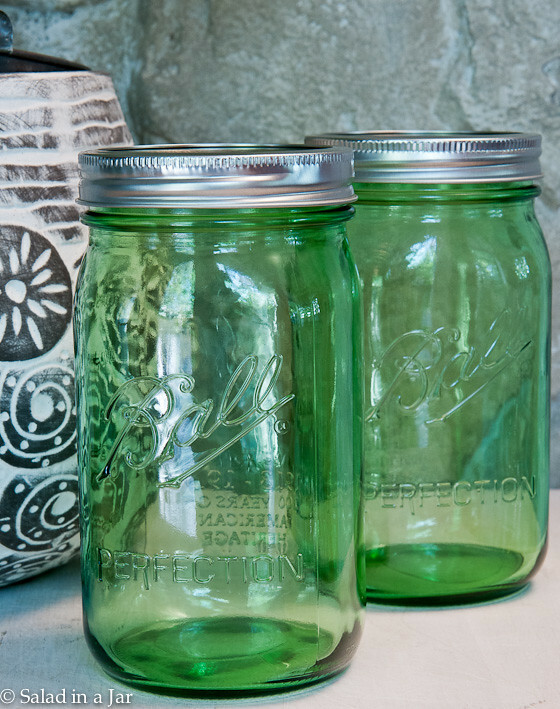 Also, because I use a LOT of Mason jars, I’m sharing about these new (to me) green Mason jars. Before: the original faux stone fireplace in all its goldy-orangey glory. What you can’t see to the left is my shiny black grand piano–not so good with rustic rocks. A dry spell has come over my kitchen here lately. I’ve been painting my fireplace, among other things. The orangey gold color of those fake rocks is no longer the boss of my den. I wanted a neutral color that would look cleaner with my favorite black and white color scheme. Because of the mysterious shiny finish on the old fireplace, I primed it with a white latex from Sherwin-Williams. Then I applied Annie Sloan’s French Linen chalk paint to add texture and a little bit of color. By the way, if you liked it better before I painted, please don’t tell me. There’s no going back. Next week, a real painter (thanks, Mario) is coming to paint my kitchen cabinets white and replace the current backsplash with white subway tiles per the recommendation of Maria over at Color Me Happy. So, it may be a little while before I get back to serious cooking. Attention, all Mason jar lovers like me! Check out the vintage reproduction green Ball jars I found at my local Krogers this week. The best part? They have a wide-mouth opening, unlike the blue ones that came out two or three years ago. Wide-mouth jars are an absolute must for packing lettuce into and unpacking from a jar. Looks excellent!! Well-done. I have a horrid red brick fireplace I really want to paint! Can’t wait to see it in person! You will love the white cabinets too. Looks great! If you need a kitchen to cook in while yours is being worked on, come on over! Very classy– your furniture really shines now! Really? All you did was an undercoat and a second coat of paint? It looks like it required a lot more effort than that. It really looks fabulous, and it is certainly more neutral so that you can change things around when you get the whim. I think you did a great job. I saw those green jars at the Kroger here, but I kept going and did not notice that they were large mouth. I just don’t buy anything else these days. As for a cooking break, they are always good. When you go back, I bet you will have renewed energy in the kitchen! It looks super stylish. A very good choice I think. LOVE!! Great job! Did you hire Maria for an online color consultation? 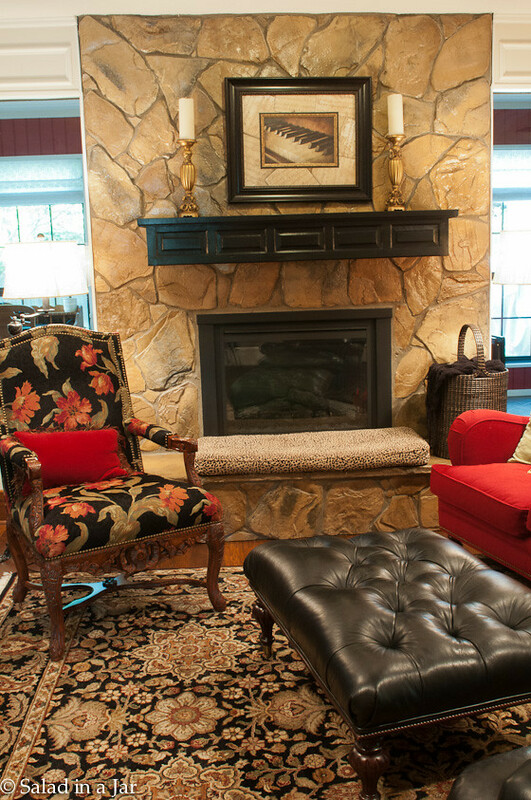 Love the fireplace with those red furnishings, plus I love those green new jars. I just saw those the other day… the blue are nice, but the green are perfect for me!